We had bringing together the best senior softball bat reviews for 2019 in this article. So you can choose exactly the kind of senior bat that is perfect for you. These reviews highlight of all types, letting you in on their pros and cons. So once you are through with these reviews, you will not only know the hottest senior softball bats, you will also know which of these precisely fits your requirements. Miken is noted for producing bats that deliver both performance and looks. The Mike Dill bat is no different. It is among the best senior slowpitch softball bats for the 2019 season. The Mike Dill bat comes constructed from 100% composite material. Thanks to its composite construction, the bat is incredibly durable while offering a great degree of flex. This makes it a good choice for contact hitters in particular. The bat features a two-piece design. The two-piece construction ensures that the maximum amount of swing momentum is channeled to the reactive barrel while ensuring minimum feedback vibrations on the handle. Mike Dill softball bat has a perfectly balanced profile overall. The balanced profile allows players to accurately swing the bat through the plate. This bat comes with a 14-inch barrel. Miken has used special Triple Matrix Core + technology in constructing the barrel. In addition, the company has also used the Flex 2 Power technology in the barrel. 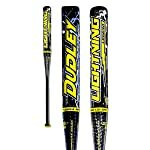 When it comes to senior slowpitch softball, the Dudley Legend bat is definitely one of the best options for the 2019 season. Dudley has used a special Fusion Composite Barrel Design. This design ensures that the barrel is incredibly responsive and delivers a quality performance. It also enables the barrel to maintain its profile and stay durable for a fairly long time. A notable feature of this bat is the Grip Spin Technology. This technology essentially allows the barrel to increase the spin revolutions of the incoming softball after the hit. As a result, the ball is able to rise higher into the air after the hit and go a longer distance. The engineered barrel is coupled with the Fusion Composite Barrel Design. This design adds to the stiffness of the handle while mitigating its feedback vibrations at the same time. The slightly stiff handle and the Grip Spin technology make this bat great not just for contact hitters but for power hitters as well. The bat has a 13-inch barrel size and a balanced design overall. DeMarini bats are known for making the top lists year after year. This year is no different. The Larry Carter Signature 16 slowpitch bat from DeMarini is definitely among the winners of 2019. This great-looking bat packs quite a punch by delivering awesome looks and excellent performance in a single bundle. DeMarini has used a special composite design in constructing the barrel and handle of the bat. The 4.One composite design essentially uses an exceptionally stiff composite material. This material is then used in multiple layers to create a barrel that is unbelievably solid without being too heavy. The soft barrel and stiff handle combo of this bat is perfect for senior softball players. It helps players hit hard and far by using the same amount of energy. The bat comes with a 13-inch barrel. DeMarini has also used a Big D end cap in the barrel. The end cap helps tilt the balance of the bat slightly towards the barrel, enabling power players to hit more accurately and forcefully. It is approved by SSA and coming from DeMarini, this is definitely a bat you can rely upon. 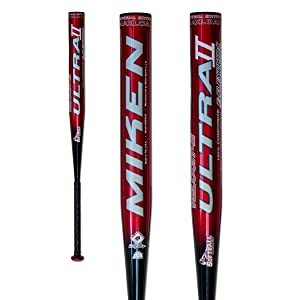 The Miken Ultra II Maxload is a limited edition bat. Only about a 1000 pieces of this model are available which makes it quite rare. Not to mention the bat features a wide range of features that make it a top performer on the plate. Miken has used the VELOCIT-E composite in constructing this bat. 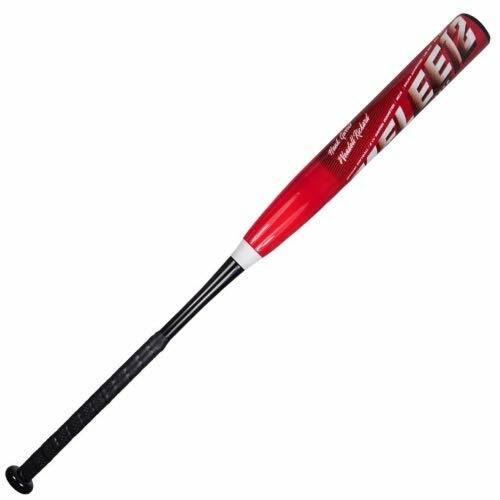 The bat has a 1-piece design, so it is very solid and a good choice for power hitters. To make the deal even sweeter for the power hitters, Miken has added a 0.5-ounce weight at the barrel end. The barrel features E-Flex Ultra which adds to the flex of the barrel and enables it to hit farther. To complement the E-Flex, Miken has used the Carbon-X shell which essentially protects the E-Flex and ensures long-term durability of the barrel. The handle of this one-piece bat comes with a super soft grip. This adds to the comfort of using this bat while letting players maintain a firm grip on the handle when swinging the bat at great speeds. Louisville Slugger requires no introduction when it comes to world-class softball equipment. The company is noted for producing some of the best bats currently available on the market. To add to its impressive portfolio, Louisville has come up with another excellent offering – the 2019 Hyper Z Senior slowpitch bat. The barrel of this bat features spring recoil composite design. This essentially enhances the performance of the barrel and enables players to hit hard. To make the bat more suitable for power players, Louisville has used a slight end-load. This adds to the speed and momentum of the bat through the hitting zone. To minimize any feedback vibrations from the handle to the barrel, the bat utilizes a special vcx vibration control connection. This helps players focus on hitting without having to deal with any sting on their hands. The handle has a slim 7/8” profile and comes with a synthetic leather grip. To ensure both grip and comfort for the players, Louisville has included a removable pyramid grip taper with this bat. The bat is definitely one of the best on the market for the 2019 season. 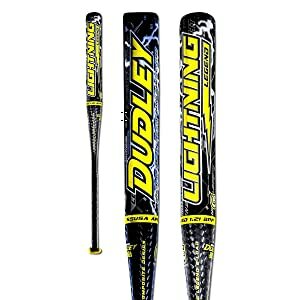 The Dudley Lightning Legend 2.0 is one of the best senior softball bats on the market this year. This bat comes with a 100% composite design, making it a truly high-end hitter. Constructed entirely from high grade carbon fiber materials, this bat is meant to give you maximum swing control as well as maximum hitting prowess. The barrel of this bat is 13 inches long, packing an extra large sweet spot which lets you hit the incoming softball with ease and precision. The bat is hot right out of the wraps, which means that it doesn’t need any break-in period and you can start hitting hard with it right away. Dudley has used its special Grip Spin technology in the construction of this bat. This allows you to gain maximum advantage when hitting and adds a lot of backspin to the softball when you hit it, throwing it into an unusual height and distance. The bat is constructed to last, you can rest assured that this is going to be a solid investment. The bat is available in 34-inch length with corresponding weight options of 26 ounces, 27 ounces, 28 ounces and 29 ounces. The 2017 Combat Rocket Launcher 1.21 is one of the hottest senior softball bats this season. 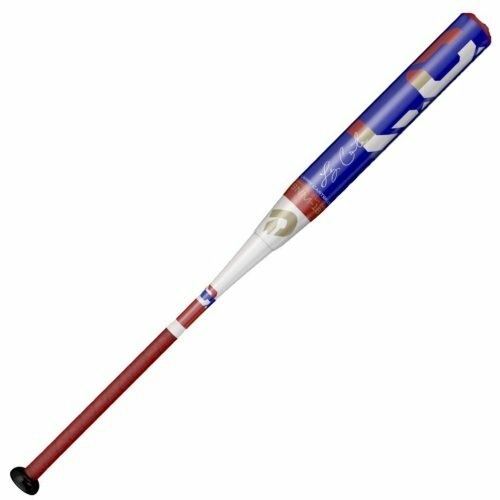 This bat promises to be a heavy-hitter and offers a truly impressive hitting prowess in the hands of the right player. The bat comes with a 100% composite design, making it incredibly durable to withstand rough and tough use, which means that you can expect this bat to last through multiple game seasons. The bat features a triple-wall barrel design, offering a lot of trampoline effect. Combat has also used the Tacky Spin Technology in the construction of this bat which adds a lot of additional backspin to every hit, letting you hit the softball farther and harder. The bat also features a 1.5oz end load which makes it a formidable hitter in the hands of a power player. The additional weight not only lets you control your swing more accurately, it channels the maximum amount of your swing momentum into the barrel, adding more force to your hit. The bat is also hot out of the wraps, which means that you can start hitting hard with this bat right after the purchase. 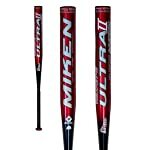 The Miken Ultra II SSUSA bat is yet another excellent senior softball bat this year. The Miken Ultra bats are the most commonly used bats in senior softball league matches, which in itself speaks for the quality and the performance of these bats. Miken Ultra II ups the bar and comes constructed entirely with 100% composite materials. The company has used its trademark Miken Carbon X-Shell technology which adds solidity to the weight without increasing its weight and at the same time, results in a barrel which is a high performer. 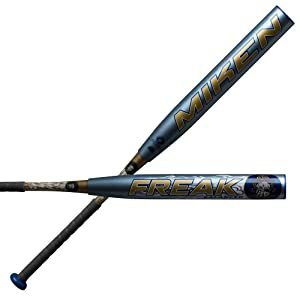 The barrel of the bat features Miken’s E-Flex Ultra Technology, offering a lot of pop and trampoline effect upon hitting. This means that when using it right, you would be able to hit the softball into longer distances. This technology also ensures that the barrel packs a sizable sweet spot, making it easier for you to hit the incoming softball at the right spot on the bat. DeMarini’s The One is a senior softball bat which is approved for use in most of the major senior softball leagues. This bat is a solid performer and is one of the best senior slowpitch softball bats this season. The bat comes constructed from composite materials and features a 13 inch S.One Stacked Composite barrel which offers heavy hitting at the plate. DeMarini has used the stacked triple wall design in the construction of this barrel. This adds a little weight to the barrel and also makes it a little stiffer, which in turns adds a lot more trampoline effect to it and channels a greater amount of your hitting force into the barrel. As a result, you are able to hit harder and farther. The 6 mm grip on the bat ensures that you are able to grip it with a smooth and strong grasp when swinging it. The bat is approved for use in USSSA, SPA and ISSA league matches. Senior softball bats refer to such softball bats which come with 1.21 bpf certification. This indicates the exit speed of the softball when it is hit by such a bat. All senior softball bats carry this certification. In simpler terms, a senior softball bat is a lot hotter than regular softball bats. As a result, a player is able to hit a lot farther with these bats and that is why these bats are commonly used in the senior softball matches. Typically, a player is usually able to hit 40 to 60 feet longer with a senior softball bat than when hitting with a regular baseball bat. Another reason why senior softball bats are limited to senior league matches is that when they hit a softball, they throw the softball at a great speed into the distance. While this speed is deemed appropriate for senior softball leagues, it isn’t considered safe for younger league matches and so, these bats are limited to the senior league matches only. Different senior softball leagues may have their own rules regarding the use of senior softball bats. So you should check with the league you are playing before purchasing your bat, so that you can be sure that the bat you are getting meets their standards and will be allowed to be used on the field. USSSA senior softball bats refer to such senior softball bats which have been stamped and certified by USSSA. ASA senior softball bats, on the other hand, refer to such softball bats which are certified by ASA. Both of these certifications are different and define the maximum limit of a bat’s performance. More specifically, the certification defines how hot should a bat be. In other words, it puts a limit on the maximum force with which a bat may hit the incoming softball. The purpose of these certifications is simply to ensure that the senior softball bats do not perform above a certain limit. That’s because hitting the softball too hard can be dangerous on the field for the other players and so, by putting a limit on the maximum hitting force of a bat, the certifications ensure that the players are same when playing. Each senior softball league comes with its own set of regulations. Some will ask you to use USSSA approved bats, other may ask you to use ASA bats. 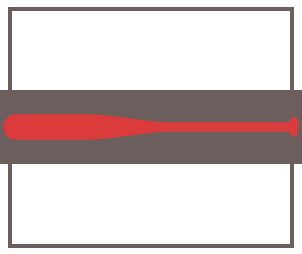 In general, senior softball bats typically come with 1.21 bpf certifications, which means that they bats are hotter than most of the regular softball bats. So while you will be able to hit harder and farther with the senior softball bats, there is still a certification limit. The best way to deal with this is know the rules of the league in which you are playing. That will help you narrow down your exact choice of the senior softball bats. Once you have done that, you can then pick from the shortlisted bats according to your needs, preferences and hitting style. The weight of a senior softball bat is an important factor. If you have a bat that is too heavy, you will not be able to swing it quickly and it may damage your timing of the hit. If you have a bat that it too light, you may be able to swing it very fast but it won’t be able to hit the ball hard enough. So you have to find a good balance and get a bat that offers both a fast swing speed as well as a solid hitting force on the plate. The construction of a bat is another very important factor. If you are a power hitter and rely on the momentum of your swing for a strong hit, you should go with a bat that has a stiff construction and a more solid barrel with less flex. On the other hand, if you are not a power hitter, you can go with a bat featuring a double or triple-walled barrel. This will offer a lot of trampoline effect and you will be able to increase your hitting distance. Senior softball bats come constructed in a wide variety of materials. The most typical ones include wood, aluminum, alloy and composite. Out of all these, bats created from composite material typically perform the best. Aluminum bats they do not offer a lot of trampoline effect and may be good for you if you are a power hitter. The use of wood bats in senior softball matches is almost non-existent. That is because wood bats tend to underperform compared to composite bats. So if you have the budget and truly wish to go you the top-grade hitter, you should ideally go with a composite bat. If you are more in the training and practice phase, an aluminum or alloy bat is always a good choice. A huge variety of senior softball bats are available in the market and we have shortlisted by making the best senior softball bat reviews above. That being said, you will be able to find a senior softball bat that perfectly suits you only after you carefully identify your needs. Do you want a bat that lets you hit harder or farther? Or are you looking for a bat that you can swing with greater speed? Would you want your bat to offer a lot of rebound? These are all questions you need to ask yourself before making the final decision. Even after you know the answers to all these questions, you will still probably have quite a few bats which seem to fulfill your requirements. So the next step you must take is go to a local store and try out these different bats. Only once you have a bat in your hand and are able to swing it, can you tell whether it suits your style or not. This way, you will finally have exactly the right fit and once you find it, it will really improve your performance on the field. After all, a good softball hitter is a combination of the right player and the right bat.